Linus Roth, who already received the ECHO KLASSIK Award as "Best Newcomer" of 2006 for his début CD on the label EMI, has now, in 2017, received his second ECHO award for a recording of the violin concertos by Shostakovich and Tchaikovsky with the London Symphony Orchestra under Thomas Sanderling. Linus Roth has made a name for himself internationally not just with standard repertoire, however, but also with his discovery or rediscovery of works that have undeservedly fallen into oblivion. He has devoted special attention to the works of Mieczysław Weinberg, both in concerts and the recording studio, making him the first violinist to have recorded all of the composer´s works for violin. His recording of all the works for violin and piano by Mieczysław Weinberg, released by Challenge Classics in 2013 to great public and critical acclaim, has been followed up by a recording of Weinberg’s Violin Concerto with the Deutsche Symphonie-Orchester and his Concertino with the Württemberg Chamber Orchestra Heilbronn (both CDs were selected as “Editor’s Choice” by Gramophone magazine). Making Mieczysław Weinberg’s oeuvre known to a wider audience is also the aim of the International Weinberg Society, which Linus Roth founded in 2015. This association organises and sponsors concerts, readings, exhibitions, interdisciplinary events and aural and written publications on the work and life of the Polish-Jewish composer. For the 100th anniversary of Weinberg’s birth in 2019, Linus Roth will curate two days of events dedicated to Weinberg, including six concerts, at London’s Wigmore Hall. In addition to various chamber music works, all Weinberg’s six sonatas for violin and piano as well as the three sonatas for solo violin will be played, with Linus Roth himself as one of the performers. Linus has played as soloist with orchestras including the Stuttgart State Opera Orchestra, the Munich Chamber Orchestra, the Württemberg Chamber Orchestra Heilbronn, the radio symphony orchestras of broadcaster SWR and Berlin, the Orquesta de Cordoba, the Orchestra della Toscana in Florence, the Royal Liverpool Philharmonic Orchestra, the Vienna Chamber Philharmonic, the Bern Symphony Orchestra, the Orchestra del Teatro San Carlo in Naples, the Cologne Chamber Orchestra and the Bruckner Orchester Linz. The conductors with whom he has worked include Gerd Albrecht, Herbert Blomstedt, Andrey Boreyko, Dennis Russell Davies, Hartmut Haenchen, Manfred Honeck, James Gaffigan, Mihkel Kütson and Antoni Wit. As a passionate chamber musician, he has performed with Nicolas Altstaedt, Gautier Capuçon, Kim Kashkashian, Albrecht Mayer, Nils Mönkemeyer, Andreas Ottensamer, Itamar Golan and Danjulo Ishizaka, among others. He has also worked together for several years with the Argentinean pianist José Gallardo. Linus Roth attended the preparatory class of Prof. Nicolas Chumachenco at the Musikhochschule in Freiburg, Germany, before going on to study with Prof. Zakhar Bron. Subsequently, he pursued his studies for several years with Prof. Ana Chumachenco at the universities of music in Zurich and Munich. Salvatore Accardo, Miriam Fried and Josef Rissin have also been important influences on him. While studying, he held a scholarship from the Anne-Sophie Mutter Foundation. 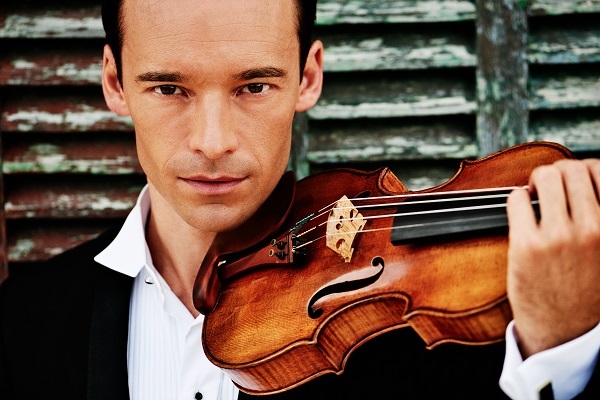 In October 2012, Linus Roth was appointed professor for violin at the “Leopold-Mozart-Zentrum” at Augsburg University and is also the artistic director of the 10th Leopold Mozart International Violin Competition, which will take place in Augsburg in 2019. In addition, Linus Roth is the artistic director of the international festival Ibiza Concerts, which he himself founded. Linus Roth plays on the Stradivarius violin “Dancla” from 1703 – a kind loan from the music foundation of the L-Bank Baden-Württemberg. Please note that no cuts or alterations of any kind should be made to this biography without the consent of Linus Roth managers: Stanisław Suchora and Mikołaj Bylka-Kanecki.